Juneau – Today, the Alaska Legislature passed legislation to increase the maximum relocation benefits available to those displaced by federally funded construction projects. House Bill 131 brings Alaska statutes in line with federal laws that were changed in 2012 with the passage of the Moving Ahead for Progress in the 21st Century Act. Prior to passage of the act, federal relocation benefit rates had not been changed in 30-years. HB 131 was sponsored by the House Transportation Committee under the leadership of Co-Chairs Rep. Louise Stutes (R-Kodiak) and Rep. Adam Wool (D-Fairbanks). HB 131 establishes a uniform policy for the equitable treatment of those displaced due to federally funded public construction and improvement projects. The bill outlines the maximum allowed payments for moving and displacement costs including replacement dwellings and increased interest costs. 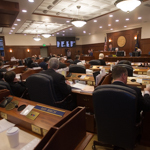 House Bill 131 passed the Alaska House of Representatives by a unanimous vote in May of last year, and the Alaska State Senate unanimously approved the bill earlier today. HB 131 will be sent to Alaska Governor Bill Walker for his signature. For more information, please contact Laura Stidolph in Rep. Wool’s office at (907) 465-4976.